In my previous blog post, I explained through the Comptroller and Auditor General of India’s (CAG) audit report, how the TNSCB constructed the Perumbakkam resettlement tenements throwing to wind the NBC norms with scant regard for people’s life. In this third and final blog of the series, I highlight how TNSCB’s lack of will and the time-buying tactics cost Chennai two important projects aimed at creating proper housing for the poor within the city, as reported in CAG’s audit report,. The government’s preference for large resettlement colonies on the outskirts of Chennai city over in-situ housing for the slum dwellers is well known and the latest CAG audit report only stands testimonial to it. A question that the report raises is that why, despite assured funding for in situ development and reconstruction projects, does the government de-prioiritise them to such an extent. Under the World Bank funded Emergency Tsunami Reconstruction Project (ETRP), the Government of Tamil Nadu in 2005 had sanctioned the construction of tenements for the tsunami affected people in Okkiam Thoraipakkam, All India Radio (AIR) site, and Nochikuppam. Okkiam Thoraippakkam and AIR site projects were planned as large scale resettlement colonies outside of Chennai and Nochikuppam near Marina was the only site chosen for in-situ reconstruction. It was initially planned to construct 7,320 tenements in Nochikuppam at a cost of Rs. 237.90 cores. While the Okkiam Thoraipakkam and AIR site schemes were completed on time, the Nochikuppam scheme still remains only on papers. The audit report has thrown light on how the TNSCB’s tardy and callous attitude kept the project in Nochikuppam a non-starter and eventually led to its failure. Had the project been implemented on time as planned it would have benefitted 2,862 fishermen families living in dilapidated tenements and 3,677 families affected by the tsunami. Further, it would have served as a recent model for in-situ housing for the poor in the city, something that is much needed given the negative impacts relocation to the fringes of the city has on the people. The audit report details how the TNSCB tweaked the plan several times since its conception and scaled it down (in terms of the number of housing units to be constructed).This in turn resulted in an inordinate delay in its implementation. Ultimately, TNSCB could complete the construction of only 628 tenements in Nochi Nagar (a part of Nochikuppam project) by 2014. It is worth a mention that the allotment of these 628 tenements was also mired in controversy with protesting slum residents alleging irregularities by TNSCB in the allotments. The audit report adds that the failure to complete the project on time prompted the World Bank to withdraw its assistance which led to the cancellation of the project. As a result the TNSCB had to return Rs. 60.57 crore of the project funds to the Government of Tamil Nadu. The Government of Tamil Nadu announced in 2011 that it will implement the project using its own funds but the project yet again remained a non-starter owing to the alleged resistance from the slum dwellers who demanded more houses considering the increase in the size of their families over these years. Perhaps the opposition of the residents of these areas is not surprising given the irregularities in allotments in Nochi Nagar. The opaque and non-participatory approach of the TNSCB and its refusal to be accountable to the people, together with its primary policy of forced eviction, give slum dwellers scant confidence in the parastatal body that is tasked with their welfare. 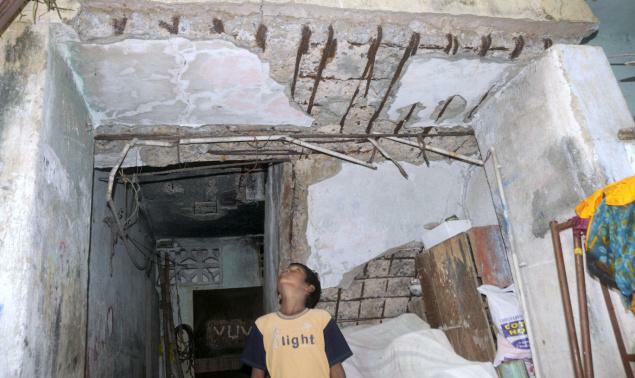 Most of the tenements built by the TNSCB during 1970s are in a horribly dilapidated condition and considered unsafe for the residents living there. The audit report reveals that though the Government of Tamil Nadu in February 2008 had sanctioned Rs. 263.77 crore for the reconstruction of 9,692 dilapidated tenements across the state, till May 2015 only 3,716 tenements were dismantled and reconstructed. While the reconstruction of 992 more tenements is in progress, work in 4,984 tenements has not yet started, putting the life of residents at great risk. The audit report cited that the 4,984 dilapidated tenements could not be demolished for reconstruction owing to the protest from the occupants who demand sale deeds for their existing tenements and more number of houses for their family members. The demand of the occupants of dilapidated tenements for sale deeds is not unreasonable as it is well known that majority of the residents in TNSCB tenements live without any kind of tenure security, in some cases indefinitely paying the TNSCB monthly installments under interminable hire-purchase agreements. If the TNSCB can muster the will to engage in negotiations with the occupants then there is no doubt that they will arrive at a solution to the legitimate demand for more houses by residents considering the organic growth in the family over the years. But rather than sorting out these issues and utilising the funds already allotted to them, the TNSCB has demanded for more funds from the Government to renovate and reconstruct 16,500 more tenements. The CAG’s audit report has given credence to what the activists have been saying for decades - that the TNSCB in deliberately going tardy in the implementation of in-situ projects andinstead constructing large resettlement colonies in the city outskirts is acting against the interests of the poor city’s residents. There is a need for a paradigm shift in the government’s approach to the housing of the city’s poor – one that has their welfare as its primary motivation. Only then will there be some meaning to the motto of the TNSCB– “to see God in the smile of the poor”.